The BBC, and a number of other outlets that should also have the budgets to do some basic background research on the subject, lapped up his words. The tax havens proceeded to stir up a whole new theatre of probity on the subject. Not long afterwards we pointed out, based on an enormous weight of painstakingly marshalled evidence, that his claims were nonsense. Well, now we have an update, courtesy of Global Witness and Christian Aid. A year after Britain’s tax havens agreed to consider the lifting the secrecy around who really owns the hundreds of thousands of companies they host, they have made alarmingly little progress and many criminals will rest easier as a result, a new Christian Aid assessment warns today. Ministers from the Overseas Territories – which include the British Virgin Islands, the Cayman Islands and Bermuda – hold their annual conference in London this week, at which the UK government ought to be fulfilling the Prime Minister’s promise to end secrecy and “set a new standard for transparency”. 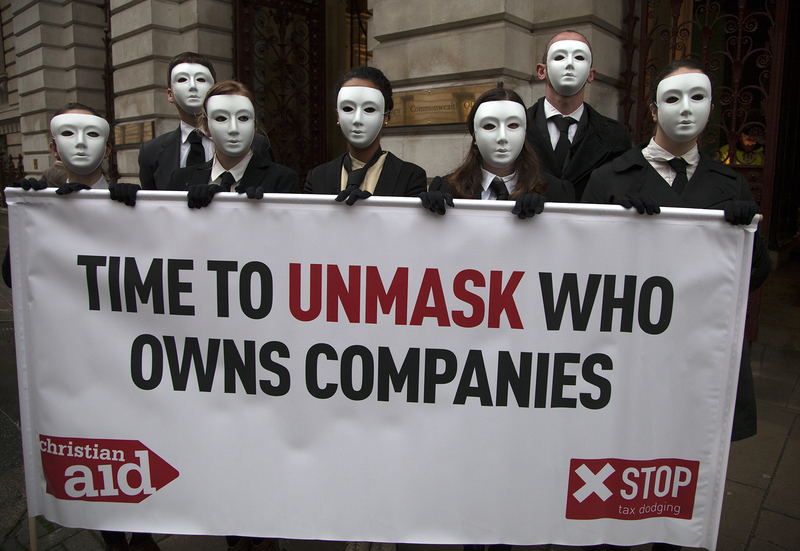 Christian Aid campaigners wearing business suits and white masks outside the conference venue, the Foreign and Commonwealth Office in Westminster, London today demanded faster progress towards transparency. A new ‘traffic light’ assessment by Christian Aid and Global Witness of the UK tax havens’ progress towards transparency around companies’ beneficial owners is at present dominated by the colours amber and red, indicating that much more needs to be done. A poll by Christian Aid and ActionAid published yesterday found that just one in five people (20 per cent) believe political parties have gone far enough in their promises to tackle tax avoidance by large companies. At last year’s meeting of the Joint Ministerial Council, which brings together political leaders from the Overseas Territories and UK Ministers, all the territories agreed to hold public consultations on creating public registers of who really owns companies. While most of them have asked for submissions, none has produced any government response or conclusions, despite up to 10 months having passed since the consultations closed. “This isn’t good enough,” added Joseph Stead. “It’s clear that secretly owned companies in the Overseas Territories are used for international corruption, money laundering and tax evasion. The BVI, the Caymans and Bermuda are in the World Bank’s top 20 jurisdictions for cases of grand corruption. They need to be among the first to change. “The failure to clean up the Overseas Territories risks being a blot on the Prime Minister’s record of getting tough on tax dodging. While the Overseas Territories stall, the UK is one of a growing number of EU countries supporting public registries across the EU to counter money laundering. · More should be done to ensure the new register is as accurate as possible, including details on how ownership is held and ensure verification of the information supplied by firms. This should be fast and simple, to help the majority who have nothing to hide, without creating loopholes which a minority will abuse. · Exceptions to disclosure: There are some circumstances where exemptions may be valid (e.g. where there is a risk of being made a target for violent protest) but they should be few and tightly defined. In addition, the public should be allowed to challenge exemptions where there is a public interest in disclosure. · Changes are urgently needed to reduce the restrictions on those who seek to get the most up-to-date information directly from companies, which as they stand could prevent the information being publicly used.